(i) The Chalk covering the northern half of the parish with a dip slope passing gently southwards under the later Tertiary deposite of the Hampshire Basin. (ii) The southern half of the parish is largely covered by the earliest deposits of the Tertiary, the Reading Beds made up of sands and clays of variable thickness overlying the chalk. (iii) Clay-with-Flints covering areas of the chalk including Catherington and the fields extending east to the top of the Lith, also fields around Hinton Farm and a large part of Blendworth particularly between Blendworth and the old church site. Flints and fossils are found across the parish in most fields and many gardens. The commonest are fossil sea urchins and sponges. All our local fossils have been derived from the chalk and all fossils represent the remains of animals that lived in the seas of the Upper Cretaceous period. The following specimens were all found in Horndean. 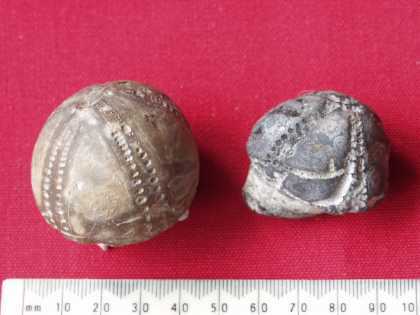 Fossil sea urchins, internal casts, right-hand specimen crushed. Fossil sea urchins - Echinocorys scutata mostly about the size of an apple, both these specimens from gardens in Horndean. 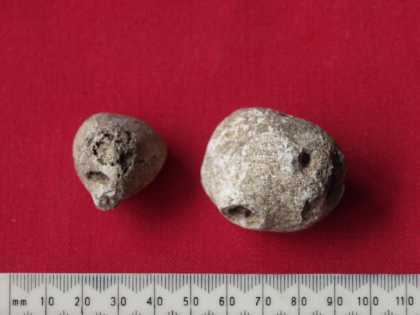 Fossil sponges are frequently found in fields around Horndean, varying in size from 1 to 5 cms across. 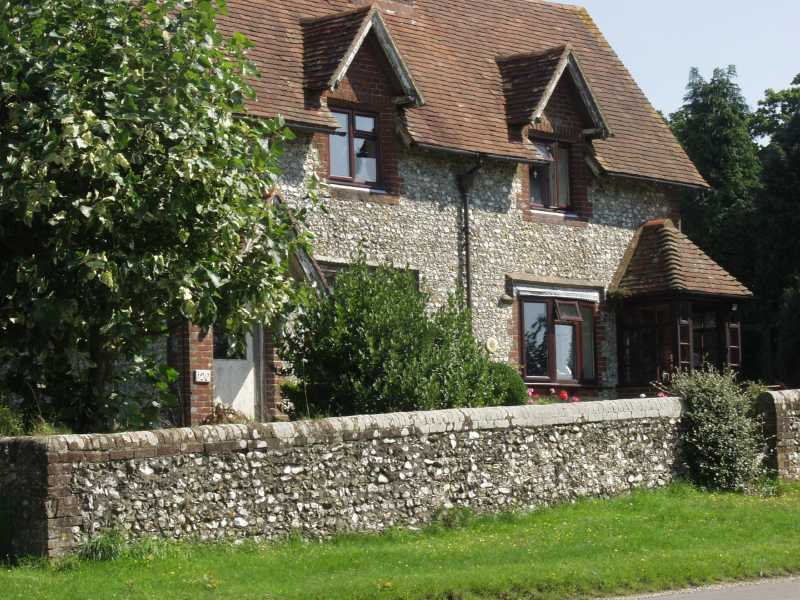 There are few fresh rock exposures in situ in Horndean but they do occur as trenches or excavations on housing developments or roadworks and are temporary, nearly all are on private land and need the owners permission but are worth inspection for the records and you may find zone fossils which could help to determine the 'horizon' in the chalk. I would be keen on hearing from anyone who has found fossils in the Horndean area and want them identified. 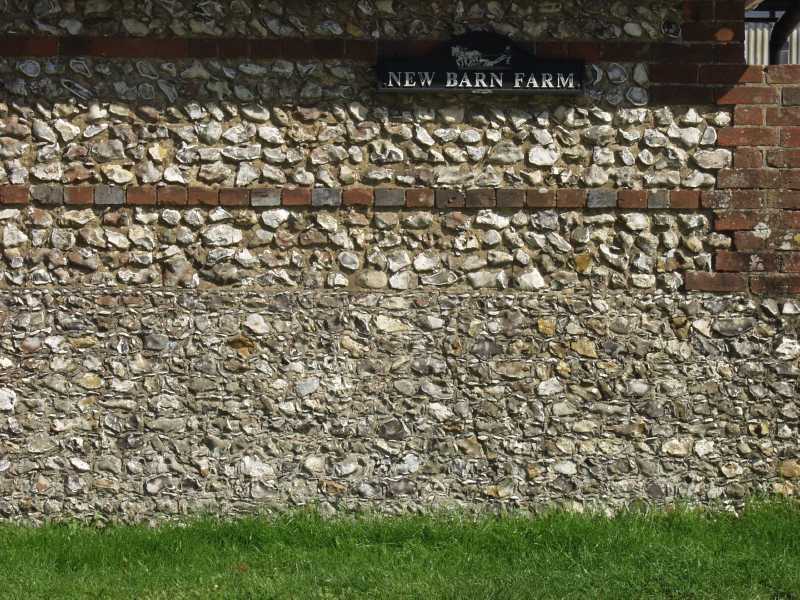 Flints are a major feature of the landscape in the Horndean Area seen both in the buildings, walls and scattered through the fields. 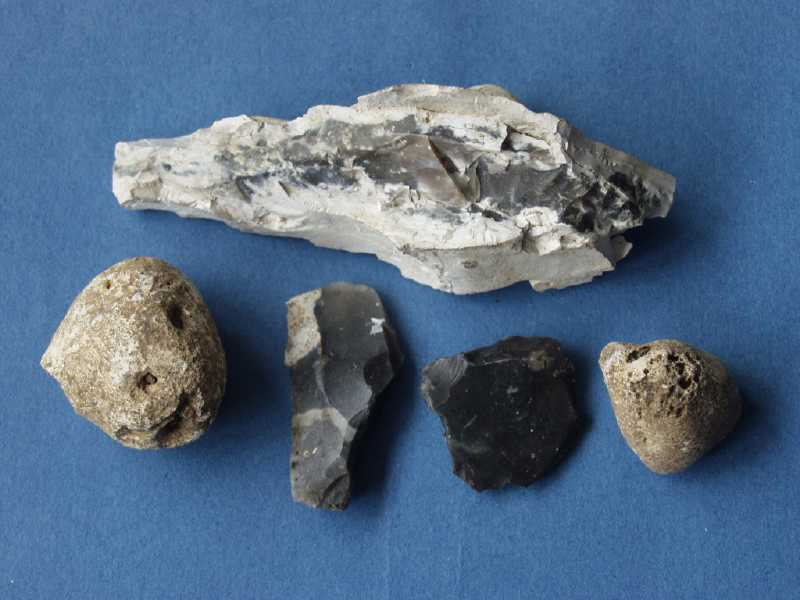 In its native state flint occurs in the form of nodules or concretions embedded in the chalk, sometimes scattered throughout the chalk but usually in layers associate with bedding planes, occasionally cutting across the bedding planes or even forming vertical columns. The layers sometimes form as flat slabs from half to 6" thick - termed tabular flints but most of those around Horndean are nodular. 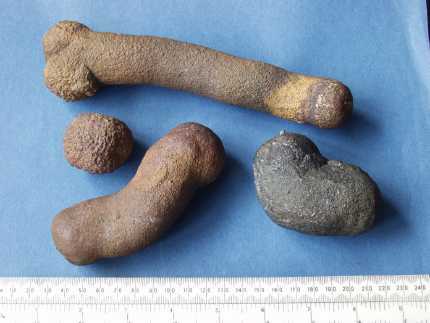 Flint nodules vary in size from smaller than a sand grain to blocks two or more feet across and in a variety of shapes from perfectly round to long 'finger' shapes to the common irregular lumps somewhat resembling giant amoeba with hollows and protuberances. They may be perforated with holes of any kind and form misshapen pipes, funnels or ring doughnuts. Small specimens were once threaded on a string and hung on the key of an outer door, on a bed-post, or round the neck, to guard against witches and the 'evil eye'. 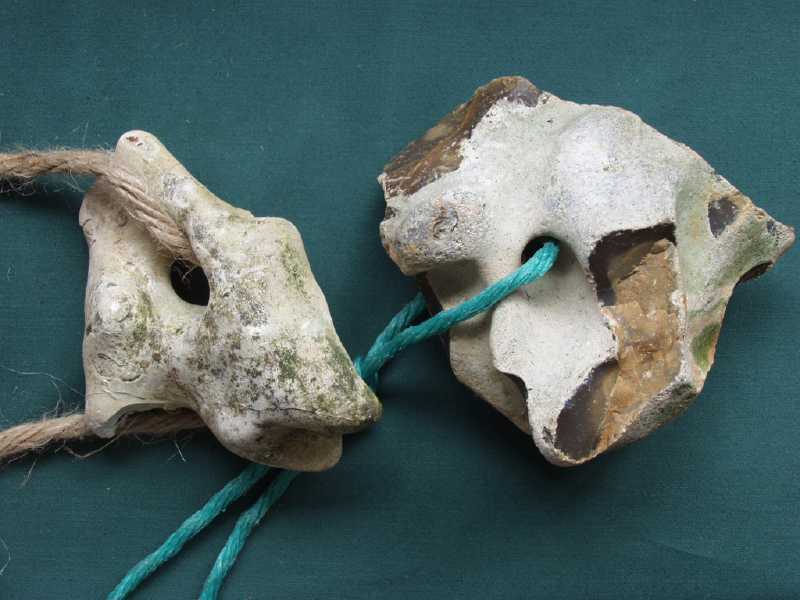 When so used they are known as 'hag-stones', may also be attached to a horse's collar as a charm against disease, still called 'lucky-stones' today. We have collected a number in the area north of Horndean, mostly large but for smaller specimens (to hang around your neck !) many can be found at Browndown, Lee-on Solent. The colours of flints are a fascinating study. Native flint is usually black, some are grey or black with grey patches. 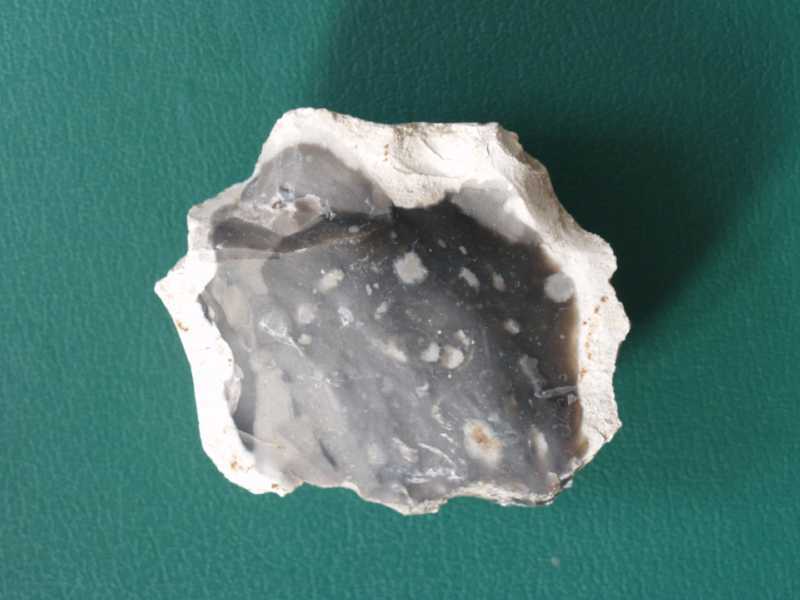 The black core has a white cortex which is an altered part of the flint and nothing to do with the surrounding chalk. The black core is not really jet black because if a thin splinter is chipped off it is seen to be transluscent and of a pale straw yellow or nearly colourless. The blackness is an optical effect, arising from the fact that light readily penetrates to the interior of the flint where it is lost by scattering, and practically none is reflected out again. This is caused by the microscopic structure of the flint. (cryptocrystalline -see references for more detail) The colour and texture varies throughout the core. Our local 'field' flints have been washed out of their native chalk and have been exposed to weather, soil-water, the roots of vegetation, contact with other minerals, mechanical action from running water or farming activities and have been subject to many kinds of staining to give white , yellow, black, brown, pink and red flints, these are 'derived' flints and this is secondary staining, not to be confused with the original colour of flint, of which many locally can be a bright blue-grey. Many flints are associated with fossils all adding to the tremendous range of types, shapes and features and leading often to false identification. When I was 10 years old my grandfather once gave me a prized possession that he was sure was a fossil apple. 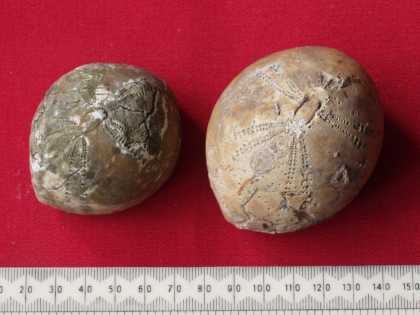 Many years later after studying palaeontology I became a 'know-all' and informed him that it was a fossil sea urchin (Echinocorys- Upper Chalk). It was however very realistically the size and green colour of an apple. Many have been found looking like animal heads and there is even a 'human skull' in the Natural History Museum in Kensington. Our own collection contains one looking like a horses head. Is 'silica' which is the dioxide of silicon (SiO2). Silicon, after oxygen is the most abundant element in the earth's crust, contained in nearly all igneous rocks such as granite as quartz, which survives after erosion as sand grains when it is stained yellow and brown by iron. There are many forms of quartz such as opal, chalcedony and flint which is 98% pur silica. Black flint appears to consist of a compact mass of microscopic needle like crystals of silica. 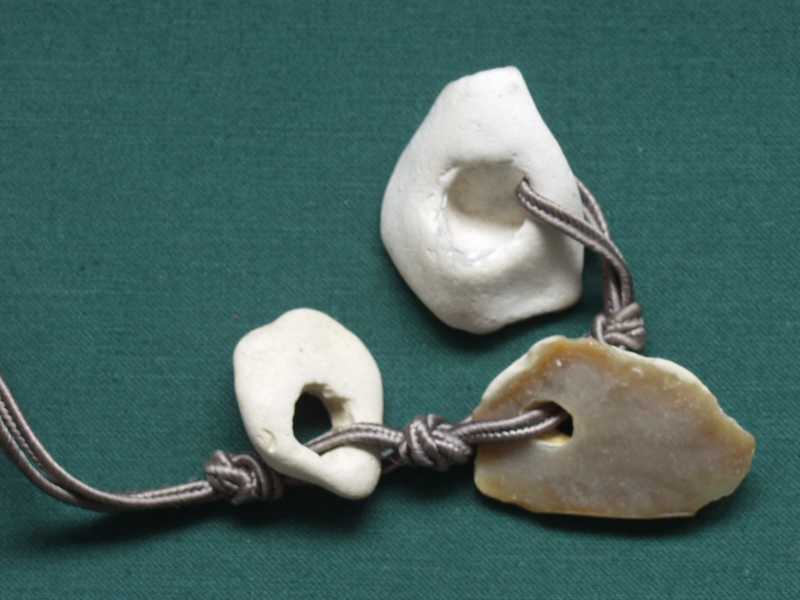 This web site includes objects other than flint that may be found in the chalk locally and often described incorrectly. The chief one is marcasite or iron nodules often explained as 'meteorites'. Some are quite extraordinary shapes as shown in the pictures. Not as frequent as flint but several can be found in the Buriton chalk quarries. The formation of chalk and flint is a detailed subject and is well described in an excellent book by Walter Shepherd "Flint, its origin, properties and uses." 1st Edition 1972 (Faber and Faber). Fascinating reading covering all aspects of flint and well illustrated. Brian Dawson 1998 "Flint Buildings in West Sussex." Planning Dept., West Sussex County Council. Click small thumbnail images to open larger (800x600) photos in a new window. Various flints showing natural colour. A typical flint from Blendworth Down. A local flint wall in Blendworth.